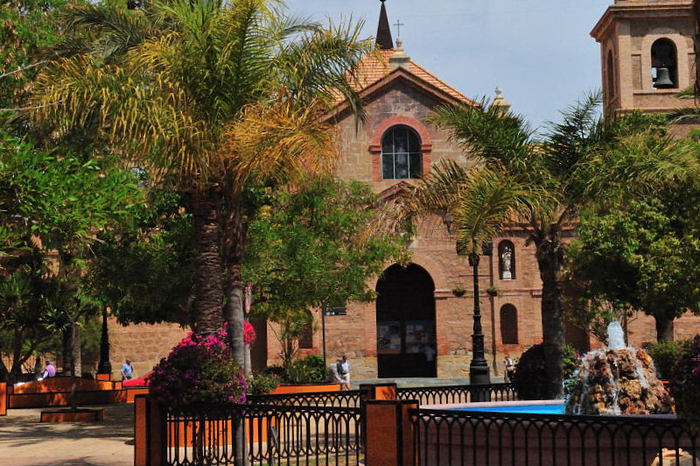 Torrevieja is not a historic town in the same way as some of its neighbours such as Orihuela with a large quantity of important historical monuments, and the first church was not built here until the end of the 18th century, but since then it has become one of the focal points of the community and still plays an important role in the town’s social life today. The original building failed to survive the 1829 earthquake which devastated much of the Vega Baja area, but some of the stones were re-used in the new construction in 1844. Stones from the old Torre Vigia de las Eras, one of the old watchtowers on this part of the coast which was destroyed by the earthquake, were also employed in the construction of the new church. In style it is neo-classical, with the stonework and two side towers topped with pyramidal structures differentiating it from many others in the area. 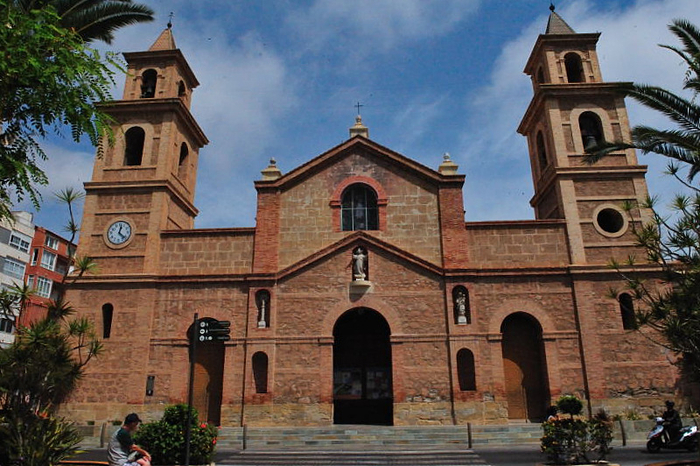 The church houses various works of religious art, and among the statues kept inside is the image of the Purísima Concepción, one of the patrons of Torrevieja and the object of great affection when she is paraded through the streets every 8th December. 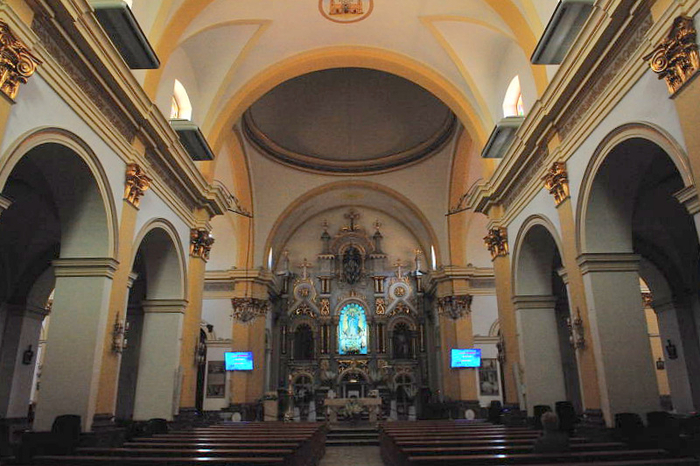 The original figure of “La Purísima” dates from before the earthquake (1791) and also survived a fire in 1936, and is now kept in the central niche of the main altarpiece, while other statues include those of Jesús Yacente, Christ on the Cross and the Virgen del Carmen. 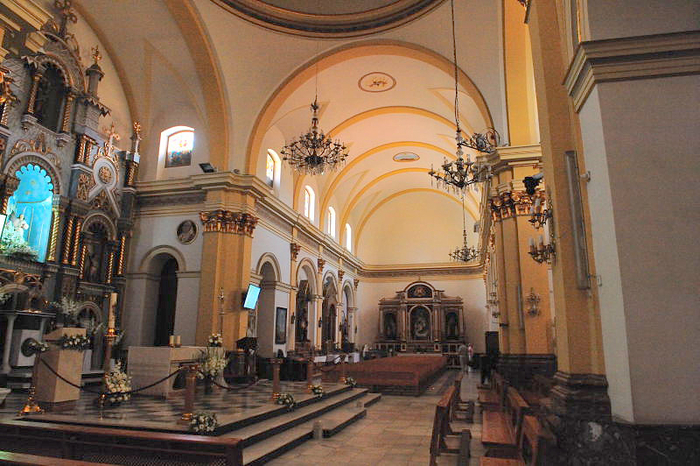 The floor plan follows the traditional Latin cross layout, and there is a constant stream of visitors and worshippers every day of the week keen to step inside one of the oldest buildings in the area. Winter (25th October to 31st March): Weekdays 10.00 and 19.30, Saturdays 19.30, Sundays and feast days 9.00, 11.00 (children’s Mass), 12.00 and 19.30. Summer (1st April to 25th October): Weekdays 10.00 and 20.00, Saturdays 20.00 and 21.00, Sundays and feast days 9.00, 11.00 (children’s Mass), 12.00, 20.00 and 21.00.